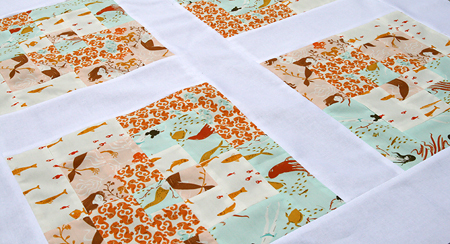 Here's a sneak peek of quilt top for my Heather Ross Mendocino Quartered Bento Box baby quilt. WOW, that's a mouthful! The back will be a surprise for you. We are under a tornado watch right now....I will start quilting it if we end up stuck in the basement (craftroom/playroom).